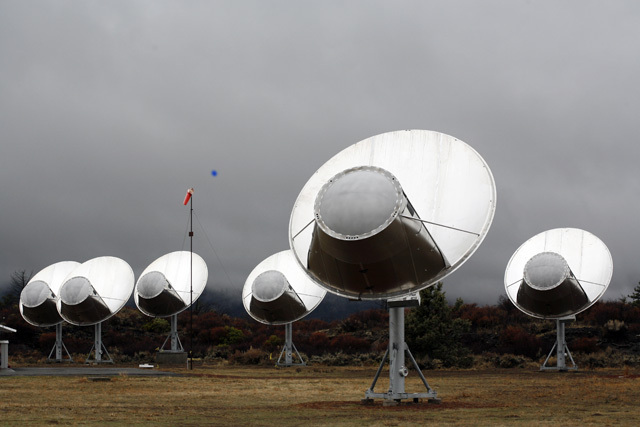 As many of you are no doubt aware, last week the Allen Telescope Array (ATA) was mothballed. In other words, cost cutting measures by US government meant it was taken offline. A lack of some $2.5 million means those running it* have to stop taking data, and shut down the array. This has engendered screams of horror from people around the world. And, I might add, not just those of us who believe that there’s life out there. The ATA is a ‘Large Number of Small Dishes’ (LNSD) Array. Its first phase went online in 2007, with 42 dishes. The idea was that it would eventually be made up of 350. The dishes are small – only 6m in diameter – with smaller dishes being cheaper for the same collecting area that larger dishes. There are technical issues, however: to get the same sensitivity as larger dishes, the signals from all the telescopes need to be combined. This, happily, is now possible with the increasingly low cost of the necessary electronics. All these beautiful dishes meant that the ATA was going to be able to conduct large, deep radio surveys of our skies which were previously not possible. Simultaneously, it was also going to scan the sky for SETI (the Search for Terrestrial Intelligence). And projects like SETI (as well as rather a lot of other science initiatives) are under increasing amounts of funding pressure. Today, a friend pinged me a link to the infographic below, demonstrating beautifully how misaligned people’s pecuniary priorities can be. It compares the cost of running SETI for a year to, well, cruise missiles and bailing out banks. Franky, it’s embarassing. Outraged? Saddened? Want moar antennae/data/knowledge about the universe IN WHICH WE LIVE? Then donate. There’s a great interview on Wired about the shutdown, the search etc with the SETI Institute’s research director Jill Tarter. ** Oh, and it’s also a ‘pathfinder‘ for the Square Kilometre Array, over which South Africa and Australia/NZ are now…competing.